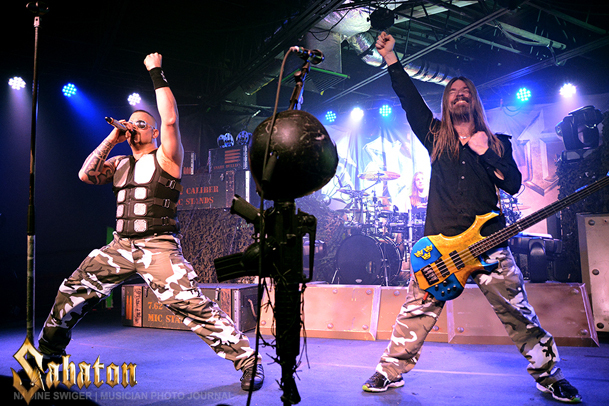 The war machine known as Sabaton invaded the Upstate Concert Hall Sunday night! The Swedish powerhouse brings a history lesson to the stage, as their songs tell a story of different war battles throughout world history. Those historical lyrics are set to a positive and energized beats! 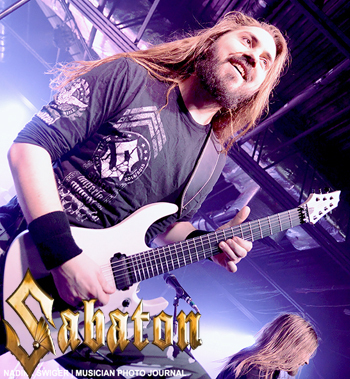 Joining Sabaton on stage was an opening artist: Leaves’ Eyes, Battle Beast and DJ Alex Kane. As fans filed into the club, the legendary metal music DJ – NYC’s own DJ Alex Kayne set the mood. Alex is renowned for spinning tunes at the legendary L’Amour nightclub in Brooklyn. He’s been credited to be the first club DJ in NYC to play Metallica, Biohazard, Queensryche, Anthrax, Megadeth, Manowar, Motorhead, and Slayer, to name a few. Alex has definitely left giant footprints in the USA metal community. He now tours, spinning tracks in numerous clubs up and down the East Coast. 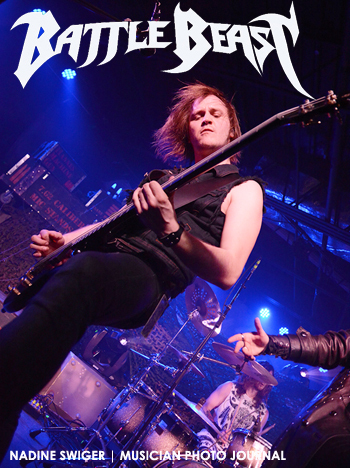 The first band to take the stage was the Finnish Heavy Metallers, Battle Beast! The stage exploded with a blast of sound! 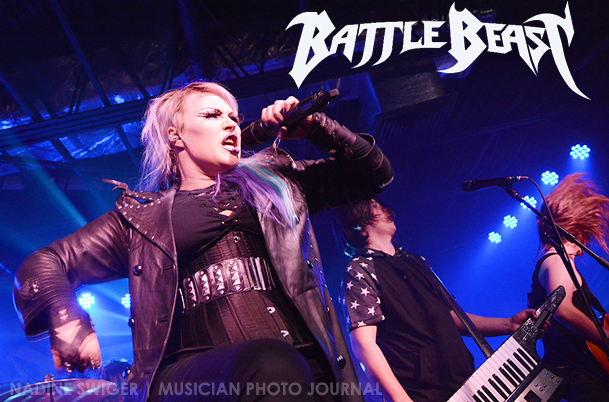 With a mixture of power metal and 80’s heavy metal, Battle Beast brings their own flavor to the scene. Lead Vocalist, Noora Louhimo, has a great stage presence and her vocal style reminds me of Lita Ford, but set to a much heavier, heavy metal style music. 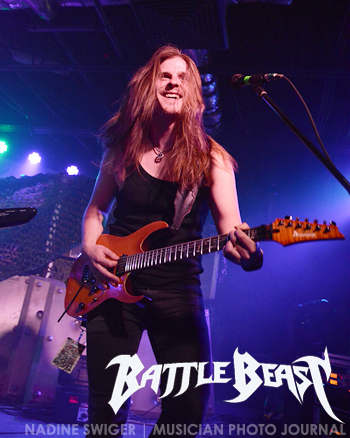 Think Lita Ford mixed with Accept and you get Battle Beast! They have a very positive and uplifting show that had the crowd raising a fist to the air and singing a lot. 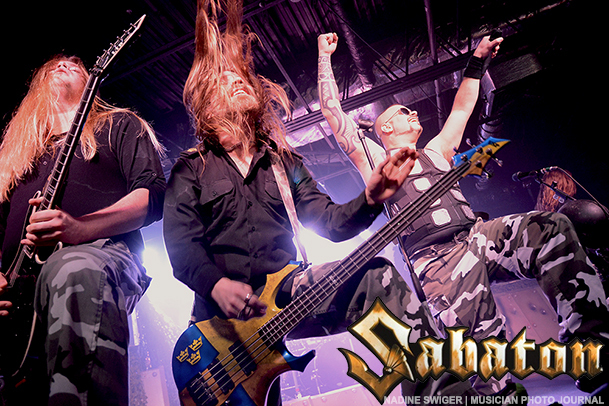 That made them the perfect band to share the stage with Sabaton as their styles definitely compliment one another! Battle Beast is out in support of their fourth studio album, “Bringer Of Pain” on Nuclear Blast Records. 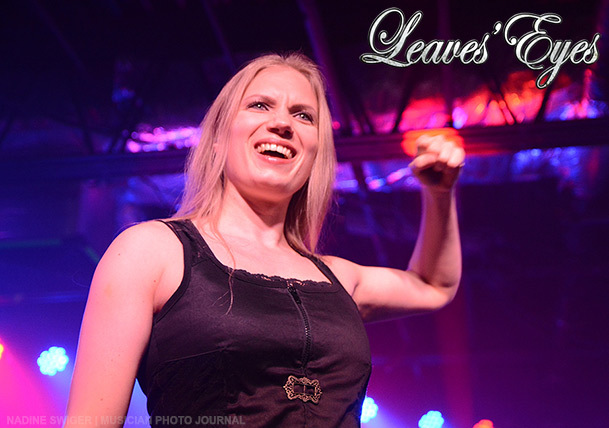 Up next was the German symphonic metal/Viking metal band – Leaves’ Eyes. 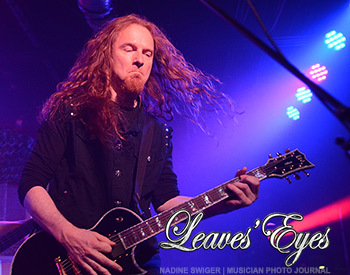 With lyrics based on Norse mythology and the Vikings, Leaves’ Eyes brings clean high pitched female vocals, much lower growl death vocals backed with solid metal music. They fall into the music vein of Nightwish. For me, they reminded me a little of Orphanage but with a wider pitch gap between clean vocals and growls. Live, they bring their own individual style to the tour, that had the crowd attention. 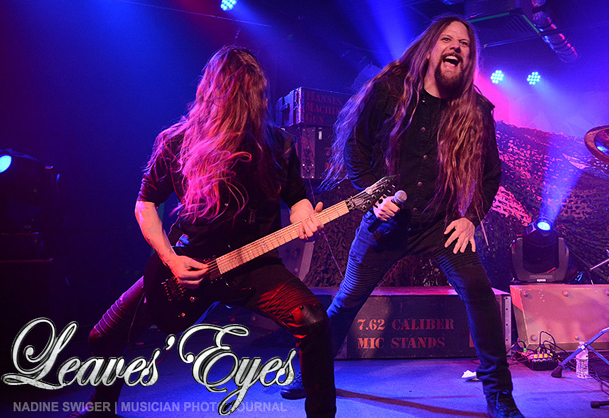 Leaves’ Eyes are out in support of their latest release, “Fires In The North” on AFM Records. Last to take the stage was Sabaton. The crowd was pumped to see them and became chanting “Sabaton” while their technicians were setting up the stage. The crowd’s anticipation grew and it wasn’t long before Sabaton hit the stage with “Ghost Division.” I don’t know if I have seen a band that comes out with such gusto and upbeat vibes, and truly has as much fun as these guys! Decked out in their camo gear, their stage set had old army boxes, camo netting and their microphone stages were guns, grenades, and helmets. Musically, they sounded spot on and tight as ever! They blew up the place as the crowd inited into a frenzy of fist in the air! 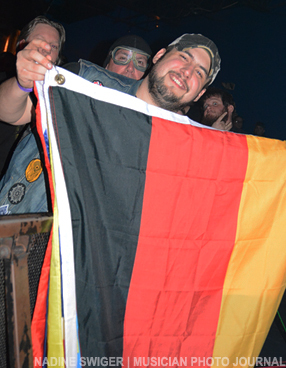 Last time Sabaton played at Upstate Concert Hall, there was a mega fan, Dave aka “The Flag Guy” in the front row. As the band played, he would hold up the flag for the country the song was about. The band thought maybe he had saw the setlist for the tour and that was how he was pulling it off. The band had changed their set list about an hour before their set and was sure they would stump him with a song they had never played live. But to their surprised, he had the flag!! Fast forward to Sunday night… Dave in the front row again with his flags. 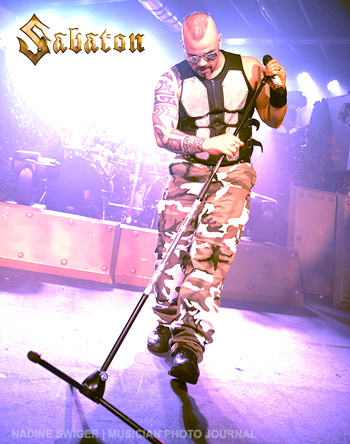 Sabaton’s vocalist, Joakim Brodén exclaimed how he was excited to see “The Flag Guy” again. They had remembered him when they got to the venue and said they were hoping he would be there. For him, they added a new song to see if they could once again stump him. The new song, “Screaming Eagle” about the 101st Airborne Division that found in the Battle of The Budge. When they asked Dave if he had the American flag, the crowd went nuts chanting “USA! USA!” (of course he did have one). It’s these little personal crowd moments that the band adds that much more to the show! 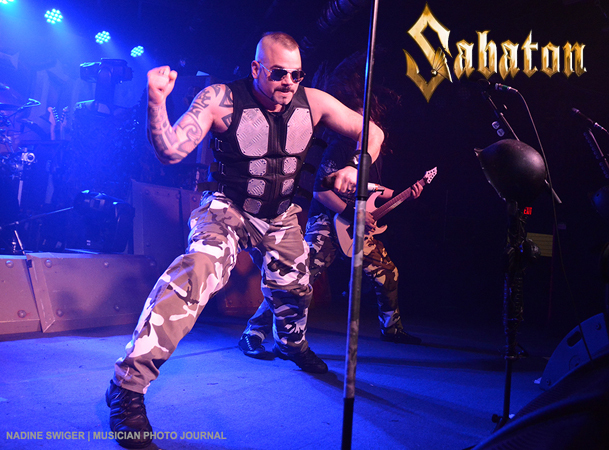 Once again, there is truly a history lesson in each Sabaton show… and if you happen to catch a show with Dave the Flag Guy… you end up with even more! 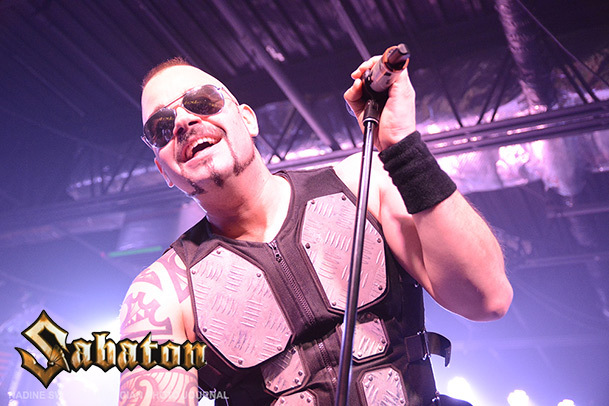 This is the first time Sabaton has done a full headlining tour in North America since 2012. They are out in support of their eighth studio album “The Last Stand” via Nuclear Blast Records. Overall, the show leaves you uplifted, excited and full of great energy!! 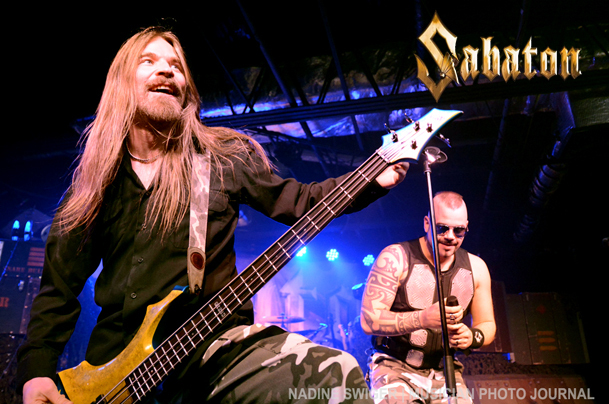 Sabaton, Leaves’ Eyes and Battle Beast will continue to tour across North America (see dates below). If you even remotely close to the show, throw on your camos and head to the show! You’ll be glad you did as they put on one hell of a show! Awe, sorry Dave!!! Thanks for letting me know so I could correct it! You Rock!! It’s actually Dave, not Steve, but thanks for the nod.